Esri, a software development and services company providing Geographic Information System (GIS) software and geodatabase management applications, announced the availability of CityEngine Web Viewer in their ArcGIS Online product this week. For the bonus, the viewer leverages WebGL. Yes, this means anyone with a WebGL-enabled browser (Chrome, Safari, Opera, FireFox) can navigate and explore uploaded 3D cities and environments created in CityEngine 2012. CityEngine is the software Esri acquired when they bought Switzerland based Procedural last year. CityEngine allows for rapid creation of 3D city models and is used in everything from movies and games (I first met the Procedural team at GDC) to architectural and proposed development visualizations. I have watched people create rather detailed cities in a matter of minutes with this powerful tool. 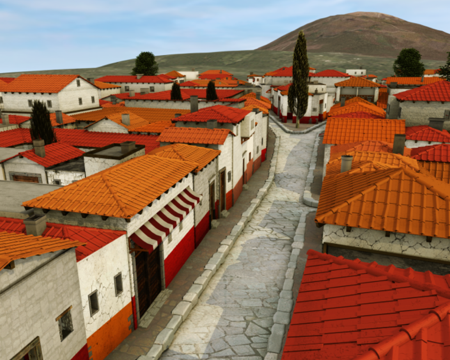 Since CityEngine is a desktop solution, these models were only able to be viewed within the software until now with the release of this web player. Check out the CityEngine video below. Beyond web3D scene basics like free navigation and zoom, CityEngine Web Viewer’s features include searching tagged content, turning on/off creator defined layers (trees, streets, buildings), and adjusting the lighting to reflect the sun’s position on a specific time of day on a specific day. 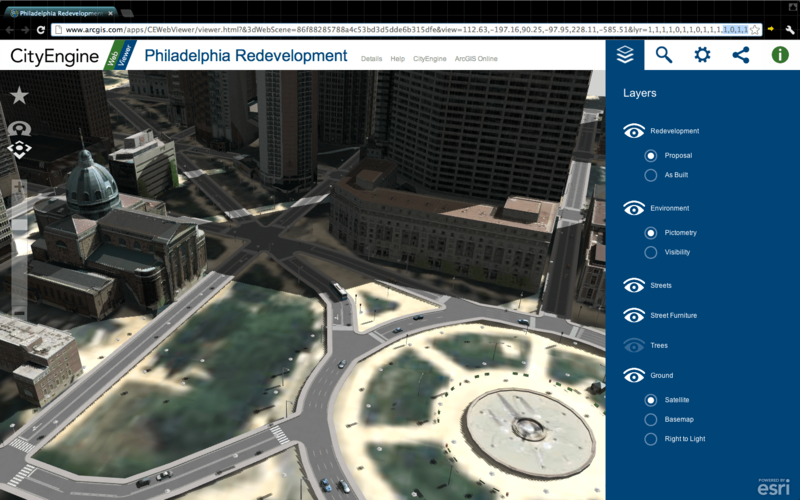 Check it out for yourself here with this 3D scene of a redevelopment in Philadelphia. Another cool example of a WebGL application and truly a great testament to the convergence of GIS data and web3D.